Tourists never leave Armenia without tasting famous Armenian barbecue or khorovats as locals call it. Barbecue is one of the special foods of the Armenian cuisine. It’s even hard to imagine a wedding, engagement, baptizing, or other celebrations without having Armenian barbecue on the tables. Armenian barbecue is completely different from American bbq; it’s usually made of big cuts of pork, not ground beef, and it is cooked on hot coals after burning a wood fire. The process of preparing barbecue is very important and it is always made by men, who like to play with fire as they associate it with women’s body. The whole idea is to get together and have a great barbecue picnic on a sunny day as Armenian barbecue is usually made outdoors. 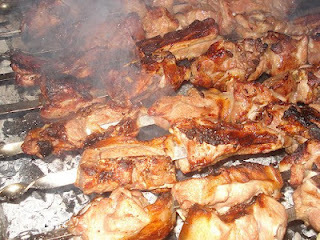 If you don’t eat pork, you can taste lamb or chicken barbecue, which are made with the same traditions. Let me present you the Armenian barbecue recipe. At first you need to marinade the meat then barbecue it. We take several chops of pork and put them in a big bowl, then add chopped onion, basil leaves, salt, red and black pepper. Mix them all together and rub the meat with hands well. Leave it in the fridge to marinade for at least 12 hours, so the taste of seasonings will penetrate inside the meat. Now let’s pass to the second part of preparing Armenian barbecue. Prepare mangal (grill) and start to put the meat on the skewers. Before barbecuing the meat, սsually Armenians also barbecue eggplants, green pepper and tomato. As vegetable barbecue is ready, men line up the skewers with meat on the grill and wait until they are ready. Meanwhile, women start clean the burnt peel of eggplants, green peppers and tomatoes. Remember, you should eat Armenian khorovats with hands, not knife and fork, yummy!!! As your nose catches the smell of barbecue, your mouth becomes watery and you just cannot resist not tasting it. 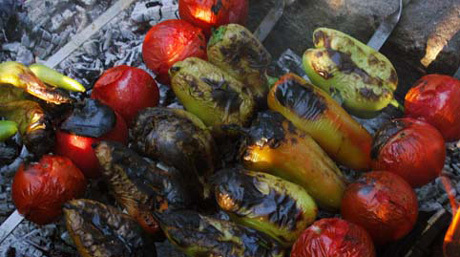 As in case of Armenian traditional dish dolma every year there is held Armenian Barbecue Festival in Akhtala, Lori province. Last year IBF, WBA and WBC champion Vic Darchinyan participated in the Barbecue Festival and opened the statue of famous Armenian actor Armen Jigarkhanyan. The organizers of the Barbecue Festival aim to raise popularity of Armenian national cuisine at world level. Don’t miss the chance to participate in the upcoming Barbecue Festival in Armenia in September this year. Awsome! I love travel! I also love BBQ! Maybe I can go to Armenia to try their local BBQ food!